Taiwan Power Co. chose General Electric Co. as the prime contractor, which ordered the reactor pressure vessel from Toshiba. Toshiba, in turn, subcontracted the manufacture to Ishikawajima-Harima Heavy Industries Co. Ltd. (IHI). GE had previously ordered the reactor pressure vessel for the first reactor from Hitachi, which subcontracted the construction to Babcock Hitachi. That was sent to Lungmen in June 2003. The Advanced Boiling Water Reactor (ABWR) was developed jointly by Tokyo Electric Power Company, GE, Toshiba and Hitachi. Within Japan it is operational at Kashiwazaki-Kariwa-6&7, undergoing trials at Hamaoka-5 and under construction at Shiga-2. Outside Japan, Taiwan's Lungmen-1&2 are the only reactors built to this design. The prime contractor is GE, but it is fair to say that this is the first real Japanese export of a nuclear reactor. The contract for the turbine was won by Mitsubishi Heavy Industries (MHI). It is not, however, the first case of a Japanese manufacturer exporting a reactor pressure vessel. Since 1971, when Toshiba won the contract for the reactor pressure vessels for Browns Ferry-2&3, Toshiba, Hitachi and MHI have each exported reactor pressure vessels. However, in each case the reactor pressure vessel was exported on its own as a component. Various types of component exports have been undertaken, ranging from reactor containment vessels, steam generators and core internals to valves, but no Japanese manufacturer has ever been selected as the prime contractor. This time, too, strictly speaking, it is a component export, but unlike the previous examples, in this case Japan played a central role in the development of the reactor and in that sense it can be said to be a first. Japanese manufacturers are now hoping to launch into full-scale exports to other Asian countries, for example to China and Vietnam. 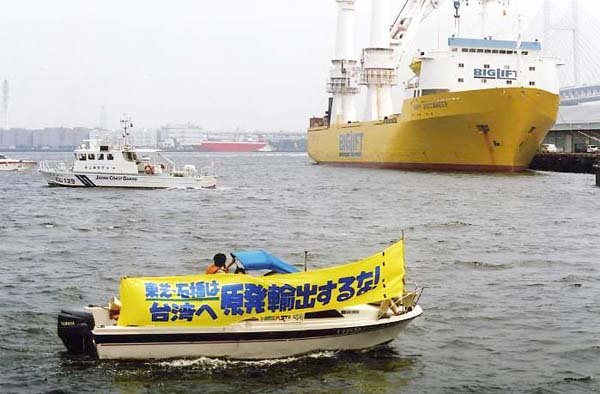 Stopping this is a major issue for the Japanese anti-nuclear movement. In this regard, note the following comment in a June 24th, International Atomic Energy Agency (IAEA) press release: "Eighteen of the 27 nuclear power plants now under construction are in Asia. Twenty-two of the last 31 new nuclear power plants to start up were in Asia as well." Following the first No Nukes Asia Forum (held in Japan in June 1993), the No Nukes Asia Forum Japan was formed (refer NIT No. 38, Nov/Dec 1993). This group joined forces with anti-nuclear energy groups throughout Asia in an effort to prevent Japan from exporting nuclear reactors. It helps activists from all over Asia to come together once a year in various locations. There people exchange information and organize symposiums about nuclear power and renewable energy. CNIC also participates in these meetings, providing information about such things as the situation regarding nuclear power in Japan. In regard to Lungmen, since Kashiwazaki-Kariwa is the only place where that type of reactor is operational, information from members of the local Kashawazaki-Kariwa anti-nuclear movement who have attended these meetings has been extremely valuable. It was this forum which called for protests against this particular shipment. In response, on July 1st a protest involving 25 activists unfolded on land and sea. The protest was planned for this day because it was the day that the ship was scheduled to depart. In the end, however, the ship's departure was delayed to the following morning due to a typhoon. Construction of Taiwan's Lungmen Power Plant is more than 50% complete. The reactor pressure vessel delivered a year ago is currently in storage, not having been installed at this stage. The reactor pressure vessel for the second reactor will also go into storage. Taiwan Power's plan is to install the first reactor pressure vessel at the end of this year and the second one in the middle of next year. A referendum to approve or reject construction of this power plant has been postponed, but is now scheduled to occur in December. The question of what can be done to prevent Japan from exporting nuclear reactors and components is therefore a difficult one. I am inclined to think that the most effective approach will be to accurately communicate the true situation in regard to nuclear and other forms of energy in Japan. In any case, the No Nukes Asia Forum has an important role to play and CNIC will continue to provide information to support the movement against nuclear energy in Asia.